Come join us in the fun and adventure of exploring the reefs and wrecks in the Florida Keys when you dive or snorkel Pennekamp Park and the Florida Keys National Marine Sanctuary. Itâ€™s A Dive is proud to announce that in the 2006 April issue of SCUBA DIVING MAGAZINE we received a reader rating of 100% for our staff and a reader rating of 97.6% for our boats and facilities. A+ Reader Rating "Premium Service...Every Day...Every Dive" IT'S A DIVE is a PADI 5 Star Gold Palm Resort located at the Marriott Key Largo Bay Resort, Mile Marker 103.8 Bayside in Key Largo, Florida. We are dedicated to quality customer service. Our goal is to build customer loyalty by being the best family scuba diving, snorkeling, and watersports operation in the Florida Keys. Snorkel John Pennekamp Park Our boats leave the dock from the beautiful Marriott Key Largo Bay Resort (MM 103.8 Bayside) twice each day taking you to the fabulous reefs of John Pennekamp Park and the Florida Keys National Marine Sanctuary. The snorkel trips go out twice a day weather permitting. Check-in for the morning trip is 7:30am with a return about Noon. Check-in for the afternoon trip is 12:30pm with a return about 5:00pm. You are able to snorkel a full hour at two different locations and we visit all of Key Largo's reefs from Molasses to the Elbow. We provide complimentary beverages (Soda and bottled water). Our quality rental gear includes "dry" snorkels and we have masks with corrective lenses at no extra charge. Snorkel vests are available but not required. 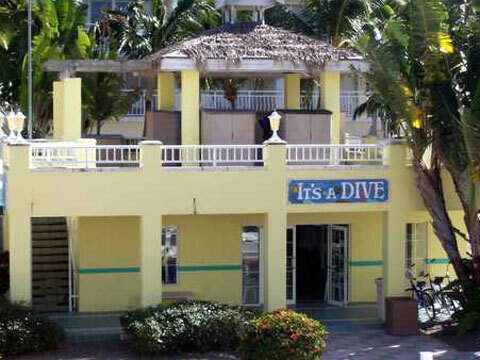 The professional staff of IT'S A DIVE is committed to your safety and enjoyment. The staff of IT'S A DIVE is experienced and committed to your safety and enjoyment while you are in the Florida The Coral Reefs of Legendary Key Largo and the Florida Keys Our boats leave the dock of the Marriott Key Largo Beach Bay Resort twice each day weather permitting. Check-in for the morning reef trip is 7:30am with a return about Noon. Check-in for the afternoon trip is 12:30pm with a return about 5:00pm. Each trip takes scuba divers and snorkelers on a two site trip to Pennekamp Park and the Florida Keys National Marine Sanctuary. We visit the world famous Molasses Reef as well as French Reef, the Elbow, and Key Largo Dry Rocks, home to the Christ of the Abyss. If wreck diving excites you, we also take scuba divers to the Benwood, Duane, Bibb, and the Spiegel Grove. Multiple dive packages are available if you plan to dive more than one day. If you need any equipment, we have a large selection of quality rental equipment at competitive prices.